I have been running again. Long distances. Often. The last time I ran like this was (also the first time) in Spring 2016, and I was training for a July half marathon. 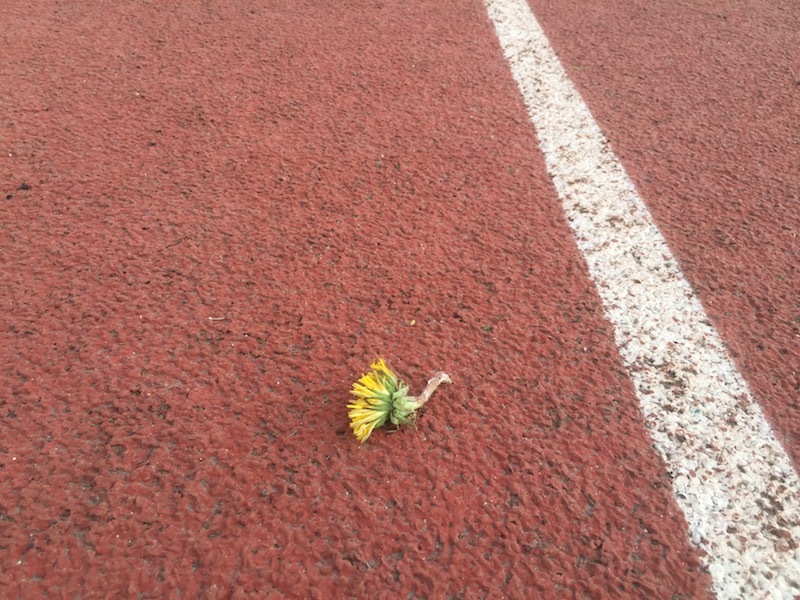 I was also enrolled in a writing class that spring and had recently written <500 words on a dandelion so, as my feet pounded the track during my Half Training Group practice (two years ago today), I was primed to notice this bedraggled spot of gold lying along my way. Dandelions. Resilient. Defiant. even in their fading light. All that spring and into the summer I struggled to identify The Why for my all-in commitment to running. I’d never been a runner like that before. As I ran through the slushy edge of Anchorage winter and onto the ice-free trails of spring I often turned to a friend, my husband, my therapist and said, “I don’t know why I’m doing this!” I diligently worked at ALL THE THINGS with an eye toward my July race goal. Each early Saturday long run took me further than I’d ever run before. Ten miles, eleven, and twelve. “You need time on your feet,” the coaches said. I learned exercises for strength training, drills for speed, and how to use foam rollers for recovery. “You need to replenish your electrolytes.” I discovered Huma and Nuun and Skratch. I showed up at every practice where the coaches led us through drills, sent us on tempo runs, hill workouts, and long miles. As the Saturday morning long runs lengthened from minutes to hours, my confidence teetered. Midnight sun leaked around the edges of our blackout curtains on Friday nights as I lay adjusting sore muscles, wrestling my pillow, and trying to sleep through my worries. “Will I be able to run that far? Can I stay focused? Can I really do this thing?” But every Saturday morning I showed up. I kept turning in my time. And yet I struggled to name My Why. When I snapped this picture I saw the scrappy courage of a dandelion. That persistent bright yellow head – the essence of dandelion holding out to the very end. I couldn’t know in that moment how my running story would soon go so wrong, but I did know quite well that life is hard. It twists and it turns. It cuts you down. It knocks you off your feet. 18 months after the surgeon fixed my ankle I’m back to running hills, speed workouts, and strength training drills. I’m more cautious this time. Not quite sure how hard to push my ever- breaking body and leery of setting goals for my competitive self, I haven’t signed up for any races. But I keep showing up. And there. I am finding My Why.